Whilst searching for mis-sold PPI I came across a document I do not recall seeing before. 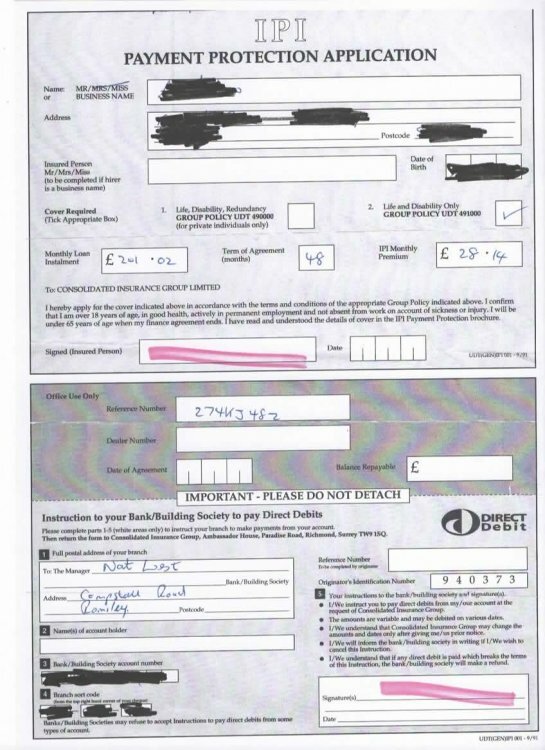 It is headed IPI payment protection application My name and address DOB Monthly loan payment £201.02 term 48 months IPI monthly premium £28.14 Unsigned undated direct debit mandate unsigned undated. Is this a valid application. Its hand written in the details boxes. .
whats was the credit this applies too? I figured they would be same company by googling them. Man, such dirty tactics these people use... Thank you DX! Well I think that one could reasonably infer that if, in the professional opinion of the doctor, a child is not fit for school and may present a risk of contagion, it can be reasonably inferred that the child is not fit to vacation for the same reasons. There may be an additional cost to secure a second doctor's letter, so I would proceed with a copy of the letter to the school in the first instance. It would be perverse, frankly, to suggest that a doctor's letter confirming a suspected prognosis of a contagious pox is somehow insufficient for the purpose of honouring the claim. So I would just send that off - in the event that the insurers are difficult, then Snowdragon's daughter should be able to secure a further bespoke letter. Because travel insurers will always require a statement of professional opinion from the doctor about whether the child was fit to travel. The letter for school is unlikely to mention fitness to travel to go on holiday. I can see that OP won't be able to get the necessary doctor's letter herself for her grandchildren, but surely she can ask her daughter to get it? I recommend though that OP checks with insurer whether they need GP to sign a specific form. Often insurers have their own medical certificate they want signed. Better to check that before approaching GP for another letter.